This image of Queen Victoria with her Christmas tree is credited with helping spread the German tradition of a decorated pine. It won’t be long now before that familiar ritual of hauling a Christmas tree into the house will be upon us. The firs, balsam, and spruce will be propped up in a corner of the living room and decorated with tiny lights, little angels and sleds – and in my case, all of the above plus a miniature Santa Claus swinging a golf club. If you think about it, cutting down a bit of the forest and dragging it into the house might seem to be a bizarre custom, but variations of this winter solstice tradition have touched almost every culture in one way or another for the last couple of millennia. The Druids and Celts routinely brought little bits of evergreen boughs, holly and mistletoe into the home during the cold, dark months of the winter, influenced by superstitions of longevity, prosperity and protection from evil – and probably because they thought that anything that can stay green through months of bone-chilling freezes must have something going for it. Even Egyptians displayed date palm greenery when the days became short in the hope that it would revive their sun god. Ironically, most Christians considered worshipping trees and plants during their most sacred time of the year a blasphemous pagan ritual until the 16th century. Germans threw caution to the wind and began bringing evergreen trees into their homes and decorating them with wooden carvings, cakes and small figures made of barley and wheat straw. Legend has it that Martin Luther was one of the first to light up his tree after seeing a glistening moonlit fir on an evening walk. But his method of attaching lighted candles to the branches to reproduce the effect sounds a little risky to me and was probably responsible for sending more than one alpine Fachhallenhaus up in flames. 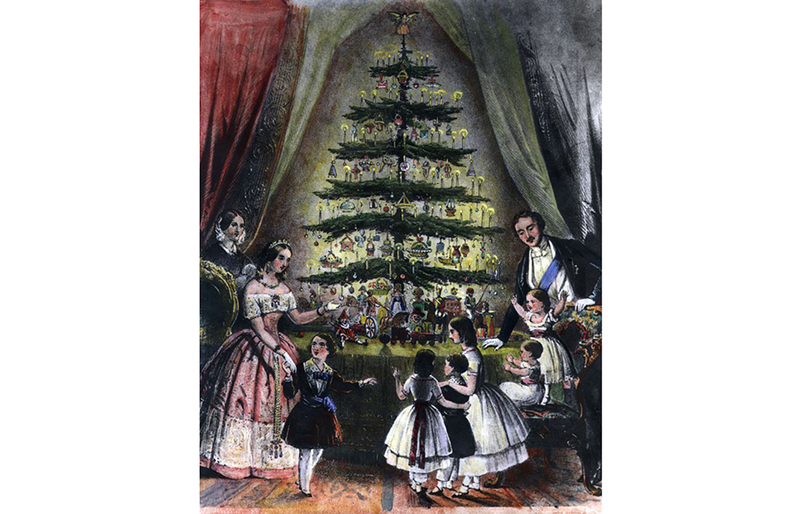 Christmas trees didn’t become commonplace in North America until a well-publicized 1848 drawing of Queen Victoria and her German husband Prince Albert posing next to their tree crossed the Atlantic and appeared in popular American magazines. Charles Dickens might have called it ‘that pretty German toy’ but that didn’t stop everyone with an axe from going out to the back forty to get one of their own. Of course there’s always the ‘real or artificial’ debate that always seems to pop up at this time of year, and at last count it’s about a 60/40 split in favour of real trees. My father was an ‘if it is not real, it’s not Christmas!’ kind of guy and every December he would turn into a big game hunter obsessed with bagging the biggest tree he could find. I remember the year I watched bug-eyed as he somehow managed to fasten a colossal spruce to the roof of the Oldsmobile and then try to squeeze the giant through our narrow front door without mishap. After knocking over a few lamps and accidentally stepping on the dog he finally managed to manoeuvre the beast into an upright position – only to discover he had to pollard a foot or two off the top to accommodate the ceiling. Why he didn’t take a foot off the trunk still remains a mystery. As for me, I’ll probably get into more hot water than a pot of New England lobsters for admitting this, but yes, I have an artificial Christmas tree. I tripped over the thing about 35 years ago when it was blocking the aisle of a packed Zellers store, sandwiched between shelves of fake holly and other plastic boughs and branches. It was a remarkably realistic six-and-a-half-foot spruce with dense foliage and a tag that described it as the ‘deluxe’ model with an equally deluxe and wildly expensive price tag of $49.95. I still have that tree and although I occasionally pine for a real pine, my little imposter will still make an annual appearance in the same place it has for the last few decades. It might be a little cat-scratched and dog-eared – and I haven’t seen a missing branch for about 20 years – but it’s become part of the family.